China Mobile Limited was bestowed the accolades of 2017 “Corporate Governance Excellence Awards” and “Sustainability Excellence Awards” by the Chamber of Hong Kong Listed Companies and the Centre for Corporate Governance and Financial Policy, Hong Kong Baptist University. A total of 10 awardees shared 11 awards, and we are pleased to note that China Mobile was the only company receiving 2 awards this year. Conferred annually, the Hong Kong Corporate Governance Excellence Awards were inaugurated in 2007 and are designed to encourage improvement in corporate governance of listed companies in Hong Kong. The Awards provide recognition and prestige for listed companies in achieving outstanding commitment to shareholder rights, compliance, integrity, fairness, responsibility, accountability, transparency, board independence & leadership, and corporate social responsibility. The Awards are renowned for its rigorous judging process and bear fitting testament to high corporate governance standard achieved by listed companies. All candidates are required to submit detailed data for preliminary screening and short-listed finalist companies are invited to make a verbal presentation to the Award Judging Panel. We are pleased to note that China Mobile Limited had won "The Asset Platinum Award" for Excellence in Governance, CSR and Investor Relations presented by The Asset. China Mobile Limited's 2016 Annual Report has proudly captured gold awards and a number of silver and bronze awards in "2017 International ARC Awards", "2016 Vision Awards Annual Report Competition" and "The International Annual Report Design Awards (IADA) 2017". In particular, the Company has been bestowed the honour of "Grand Award" in "2017 International ARC Awards". 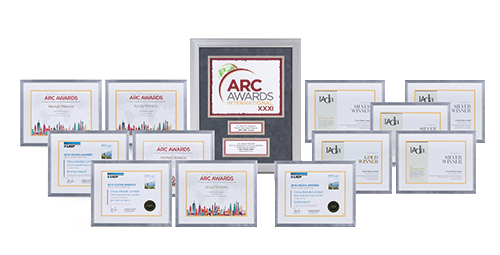 "International ARC Awards" is one of the world's largest and independent competitions honoring excellence in annual reports and corporate communications, and is recognized as the "Academy Awards of Annual Reports" by the financial media. The contest has achieved world-wide recognition and attracted about 2,000 entries from 33 countries as it entered the 31th year. The League of American Communications Professionals (LACP) Vision Awards Annual Report Competition is one of the world's most influential annual report competitions, where all entries are comprehensively judged by experienced media professionals based on criteria such as overall impression, cover design, chairman's statement, report narratives and creativity, message clarity and information accessibility. With the aim of honouring companies delivering exceptional investor relations and annual report production performance, IADA is organised on a half-yearly basis, and each year, thousands of companies, design houses and professional printing and production firms enter into the competition. China Mobile Limited was awarded the accolades of "Best Investor Relations Company" in the "7th Asian Excellence Award 2017" held by Corporate Governance Asia. Mr. Li Yue, the Executive Director and CEO of the Company, was also honored with the "Asia’s Best CEO (Investor Relations)". We are pleased to note that the China Mobile brand was included in the Millward Brown and Financial Times' "BRANDZ™ Top 100" for the twelfth consecutive year. The China Mobile corporate brand, with brand value of $56,535 million US dollars, occupied the 17th place in the globally ranking. BRANDZ™ Top 100 has been jointly released by Millward Brown and Financial Times since 2006. We are pleased to note that China Mobile Limited ranked 21st on business magazine Forbes' "Global 2000" 2017. The Forbes Global 2000 recognizes the world's biggest and most powerful public companies as measured by a composite ranking for sales, profits, assets and market value. We are pleased to note that the Company had won Bronze prize in "Stakeholder Communications - Best Practice" in Questar 2017 Awards, hosted by independent award organization MerComm Inc. whose awards programs have earned world-wide recognition. China Mobile Limited was awarded the accolades of The Best of Asia - "Asia's Outstanding Company on Corporate Governance" in the "12th Corporate Governance Asia Recognition Awards 2016" held by Corporate Governance Asia. Mr. Shang Bing, the Chairman of the Company was also honored with the "Asian Corporate Director Recognition Award 2016". We are pleased to note that the Company’s website had won Silver prize in "Website/Mobile Media: Corporate" in 2016/2017 Mercury Awards, hosted by independent award organization MerComm Inc. whose awards programs have earned world-wide recognition. Mercury Awards has been held for 30 years now, with a focus on promoting excellence and innovation of corporate websites.